Barlow center Libby Mathis spun toward the basket and converted a three-point play early in the second quarter. 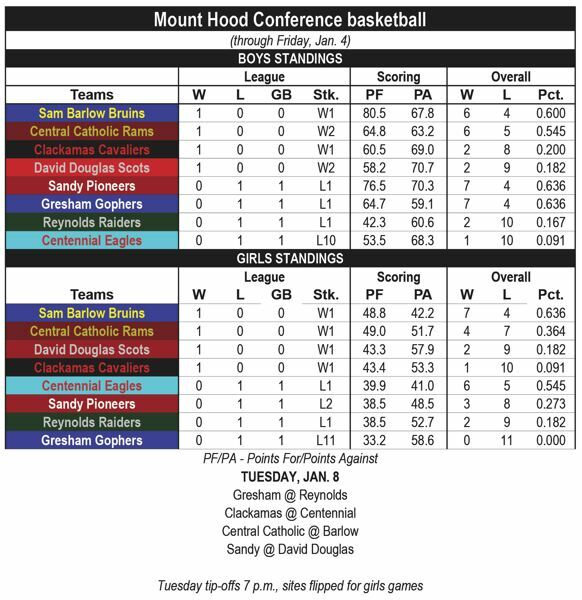 Little did she know it would prove to be the winning points, as the Bruins raced to a 52-18 win to open the Mount Hood Conference girls basketball season Friday night. The play also marked the start of four straight Barlow possessions that produced points. Maicee Bradley followed with an underhand scoop along the baseline, then fed a pass inside to Mathis, who went over her defender and off the glass for two points. The scoring spree finished with Whitney Waddell swiping a steal and passing the ball across court to Melanie Hiu, who sank both free throws after being fouled on her way to the hoop. Mathis received a pass in the high post, waited for the defense to collapse, then fired a sharp pass to the far side of the floor where teammate Monica Gifford sank a 3-pointer to send Barlow into halftime with a 29-7 lead. "We passed the ball and had good movement. We could not miss in that first half," Mathis said. "That boosts your confidence and just makes you want to play better." The Bruins kept it rolling after the break with Emory Miller spinning away from a defender on the block and swishing a short jumper. Centennial's Charlotte Marcum connected on a corner 3 to end an almost 10-minute dry spell for the Eagles. Despite a commanding lead, Barlow kept winning the hustle plays to the final horn. Miller showcased that effort by diving on the floor after a loose ball to start the fourth quarter. She passed the ball off to Waddell, picked herself up and sprinted to the offensive end and got it back with a bounce pass in the lane. Miller was fouled on her way up and turned her hustle into a point from the free-throw line. "We knew they were a tough team and never knew what defense they were going to throw at us," Miller said. "It was a big doubleheader crowd, and we stayed fighting the entire time." Centennial and Barlow were the only MHC teams to post winning records through the preseason. 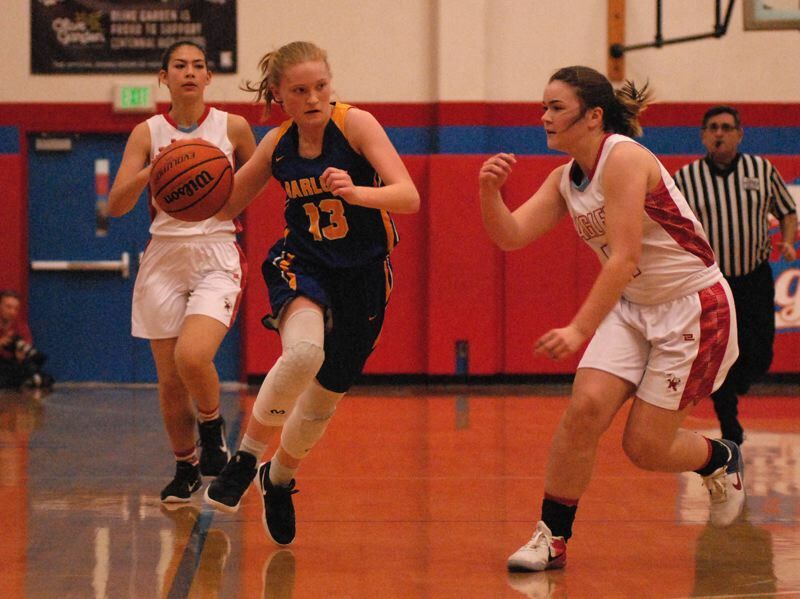 Barlow plays at Central Catholic at 7 p.m. Tuesday, while Centennial is at Clackamas at 7:30 p.m.
Barlow (52) — Monica Gifford 11, Libby Mathis 11, Emory Miller 8, Whitney Waddell 8, Lindsay Barden 5, Melanie Hiu 4, Maicee Bradley 3, Hannah Rispler 2, White, Richardson, Matthews. Centennial (18) — Charlotte Marcum 6, Domonique Andrews 4, Naomi DayChild 4, Maggie Martine 2, Ellie Basinski 2, McHone, Kramer, Miller, Green. This story is slated for our Tuesday, Jan. 8, print edition. DAVID DOUGLAS 67, REYNOLDS 28 — David Douglas broke out of a 9-9 deadlock in the early stages, tweaking its full-court press to forced turnovers on its way to a 43-point first half. Shayla Slossar did most of the damage with seven baskets. She shared the team's scoring lead with Paige Collins — each with 19 points and combining to go 7-for-7 at the free-throw line. 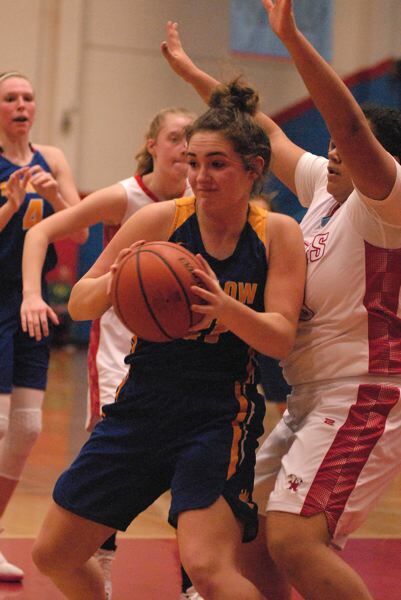 Christina Chernoff led the Raiders with 11 points — six of them coming in the fourth quarter. David Douglas (67) — Paige Collins 19, Shayla Slossar 19, Cheska Magada 11, Jenna Stradley 6, Marake Wandwassen 2, LaMirra Luster 2, Antina Bileibi 2, Lydia Collins 2, Magada, Duku, Flowers, Zhen. Reynolds (28) — Christina Chernoff 11, Brisa Avalos 9, Josephine Badoni 4, Lupita Dominguez 3, Elabd, Curtis, Tang, King, Andersen, James. 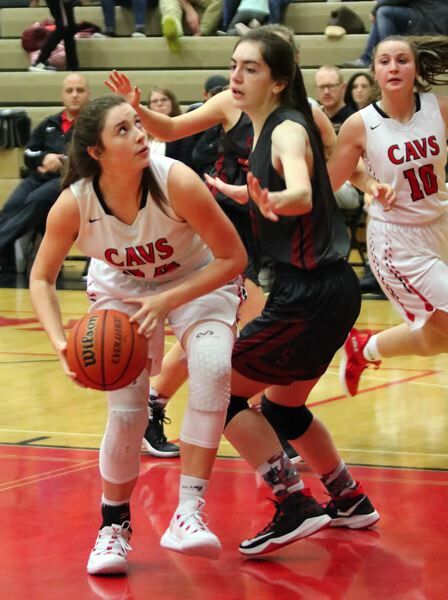 CLACKAMAS 68, SANDY 23 — The Cavaliers held Sandy to a single free throw in the first quarter and broke the game open with a 28-point second quarter that saw Ava Peterson knock down a trio of 3-pointers. Teammate Bella Garcia matched that feat for the Cavs in the fourth quarter. Izzy Cabrera led the Pioneers with 12 points — all from 3-point range during the middle quarters. Sandy (23) — Izzy Cabrera 12, Gentry Turin 4, Bella Kansala 2, Morgan Maul 2, Brooklyn Adams 1, Athena Thomas 1, Tana Dwyre 1, Dukart, McCrae, Dobson, McNutt. Clackamas (68) — Ava Peterson 11, Bella Garcia 11, payton Mongelli 9, Olivia Morris 8, Sydney Benedict 6, Kiah Wetzell 6, Maddy Filler 6, Kalani Hayes 5, Lily Bui 3, hallie Byzewski 2, Payton Benedict 1, Tacheny. CENTRAL CATHOLIC 61, GRESHAM 13 — The Rams shut out Gresham through the first quarter and broke the game open with a 27-point second quarter that saw seven players put the ball through the net. Gresham (13) — Jasia Mosley 4, Heaven Schab 3, Steff Arrango 2, Destiny Ogbeama 2, Abby Walker 1, Toni Gould 1, Algong, Jones, Goodwin, Williams. Central Catholic (61) — Tiana Abraham 12, Megan Potter 10, Bella Scarlett 7, Taia Feimoefiafi 6, Ella Burgess 6, Kate Pitzer 5, Claire Bass 5, Marianna Pyne 4, Abby Cooper 3, Carly Hicks 3, Raimondo, Montgomery, O'Leary, Allen.